Non-resttable axial fuse. Thermal Fuse 240°C. RY Thermal Fuses 250 Volt 10 Amp from 0c to 285c sold as pairs. Series: MICROTEMP. FUSE, THERMAL, AXIAL, 16A, 184ºC. Functioning Temperature: 184°C. Actuating Temperature Max: 184°C. Fuse Current: 16A. Product Information. Series: MICROTEMP. 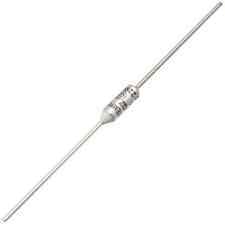 FUSE, THERMAL, AXIAL, 16A, 93ºC. Fuse Current: 16A. Functioning Temperature: 93°C. Holding Temperature: 78°C. Actuating Temperature Max: 93°C. Product Information. Non-resettable axial fuse. Thermal Fuse 72°C. 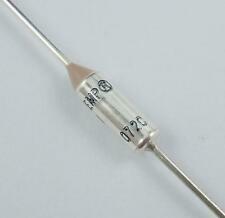 RY-01 Thermal fuse Rated Temperature: 240C. Features a large rated current of up to 15A 250V AC. Series: MICROTEMP. 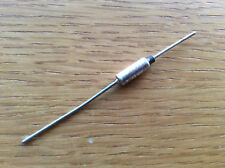 FUSE, THERMAL, AXIAL, 16A, 104ºC. Fuse Current: 16A. Functioning Temperature: 104°C. Actuating Temperature Max: 104°C. You are purchasing part number G4A01184C Manufactured by THERMODISC. FUSE THERMAL 184°C 10A 250VAC. Fuse Current : 10A. Functioning Temperature : 184°C. SF113E SEFUSE NEC Thermal Fuse 113°C Degree 10A 250V. Commonly used in Coffee Makers, Rice Cookers, Chi Styling Irons, Air conditioners, Instapot, Instant Pot,etc. Fusible alloy type thermal link. Thermal Fuse, Widely Used in Electric Current Appliance, Such as Electric iron, Therm electric Blower,Microwave oven,Refrigerator etc. as Heat Protection. For sale is one lot of 5 piecesMICROTEMP 4136A CDANF 60C TF THERMAL CUTOFF FUSE. 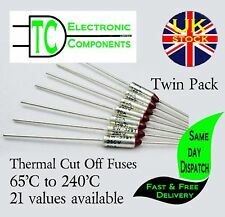 LOT OF 20 PCS RY SE FUSE Cutoffs SF240E Thermal Fuse 240 °C 10A 250V. 10pcs Thermal cutoff RY SF96E 99°C 15A 250V thermal fuse. RY SF96E 99°C 15A 250V thermal fuse (Funnctioning temperature 99°C). It is used for a great variety of applications such as Lot of 10pieces. RY Tf SF126E 123°C 15A 250V thermal fuse (Funnctioning temperature ). 15pcs Thermal cutoff RY Tf SF126E123°C 15A. Lot of 15pieces. It is used for a great variety of applications such as Comfort Conditioning Appliances (e.g. air conditioners, fans, humidifiers, heaters). Circuit board hermal fuse 250 volts 2.5 amp 139C common on PCB'S and in fans etc. One Pcs SF214E SEFUSE Cutoffs NEC Thermal Fuse 216°C 216 Celsius Degree 10A 250V. Thermal Fuse 133°C or (271.40°F) 15A / 125VAC 10A / 250VAC. 15A / 125VAC 10A / 250VAC. 1 piece of Thermal Fuse (Cut-off/cutoff or temperature fuse or TF). 133°C (133 degrees Celcius) or 271.40°F (271.40 degrees Fahrenheit). RY Tf 216°C 216 DegC 15A 250V thermal fuse (Funnctioning temperature 216°C). 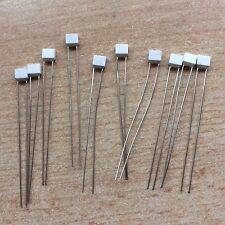 10pcs Thermal cutoff RY Tf 216°C 216 DegC 15A 250V thermal fuse. It is used for a great variety of applications such as Lot of 10pieces. Body Depth: 2.5mm. Body Height: 6mm. Body Width: 6mm. Great range of products. Everything you need for your Electronics Project from one supplier. This does not affect overseas orders. We want you to feel confident that you are purchasing the right product from the right Electronic Component supplier. You are purchasing part number G4A01192C Manufactured by THERMODISC. FUSE THERMAL 192°C 10A 250VAC. Functioning Temperature : 192°C. Fuse Current : 10A. RadioShack Lot of 2, 270-0208 Thermal Fuse 250VAC 15A - Ships Today! Thermal Fuse 227°C or 441°F 250VAC 15A. MICROTEMP® thermal fuses from Therm-O-Disc® represent the global standard in thermal fuses. RY Tf 133°C 133 DegC 15A 250V thermal fuse (Funnctioning temperature 133°C). 5pcs Thermal cutoff RY Tf 133°C 133 DegC 15A 250V thermal fuse. Lot of 10 pieces. It is used for a great variety of applications such as. 15 Thermodisc Microtemp G7 Series Thermal Fuses 91*C.
MICROTEMP® thermal fuses from Therm-O-Disc® represent the global standard in thermal fuses. Open temperatures (Th) from 77°C to 205°C Holding temperatures (Tf) Th – 15°C Maximum overshoot temperatures (Tmax) up to 300°C CTI 250. 5pcs Thermal cutoff RY Tf SF172E 175°C 15A 250V thermal fuse. RY Tf SF173E 175°C 15A 250V thermal fuse (Funnctioning temperature 175°C). 5pcs Thermal cutoff RY Tf 175°C 175 DegC 15A 250V thermal fuse. Thermal Cutoff 110°C 250VAC 2A 2-Pin THRU Axial. EYP2N124 10pcs. Thermal Cutoff 110°C 250VAC 2A 2-Pin THRU Radial. 10pcs Thermal cutoff RY Tf SF155E. RY Tf 155 157°C 15A 250V thermal fuse (Funnctioning temperature 157°C). °C 15A 250V thermal fuse. Lot of 10pieces. It is used for a great variety of applications such as. An ESKA thermal fuse that is perfect for surface mounting and panel mounting on appliances. Rigid wire connection, short/long wires. Nominal current: 10A. The fuse has been tested to VDE 0631 standard. RY-01 Thermal fuse Rated Volt:250V (AC). Rated Temperature: 240C. 1/4-in spade connectors. Thermal Fuse. Surface mount design.